During Riverton Free Library’s 2018 Riverton Candlelight House Tour this Saturday 4-9pm, be sure to make a stop at the Library where the Historical Society will offer a glimpse at some seldom seen items in our collection. The Historical Society’s Museum-for-a-Day, last seen in 2016, returns with displays on the first floor as well as in the basement. On the first floor, be sure to see the tiniest house on the tour. This painstakingly detailed doll house is a replica of the real dwelling at 806 Main Street. You will have to come on Saturday to see the inside furnishings and details, complete with a Christmas tree and doors with crystal doorknobs. 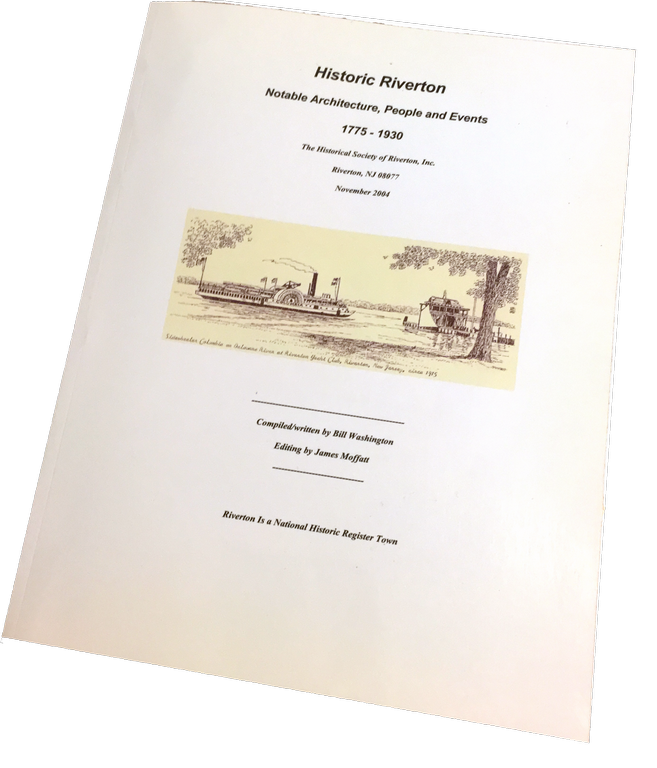 Among the local history themed items for sale are our mugs, Romance of Riverton DVDs, Bay Ruff’s Ruff Copy, Bill Washington’s Historic Riverton, gift memberships to the Society, and some reproduction prints and enlargements. 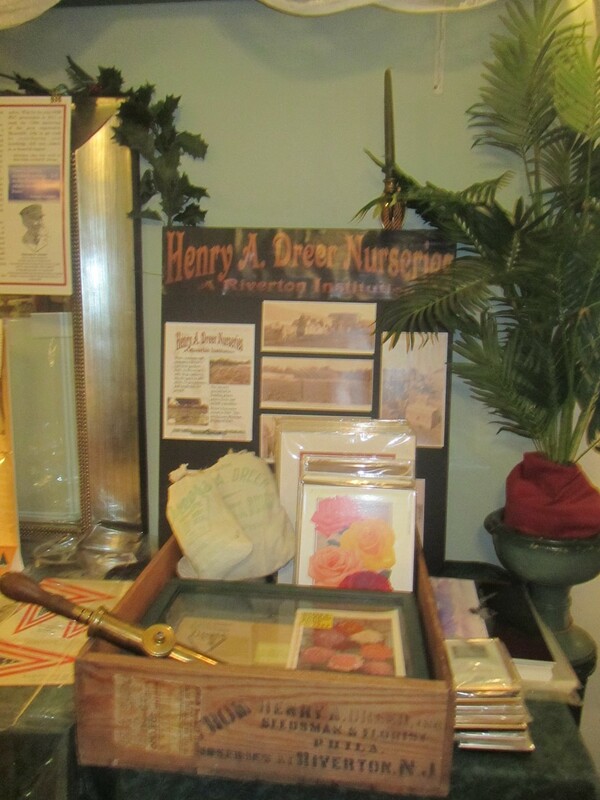 Downstairs, see displays of vintage clothing, photos of old Riverton, our salute to veterans, a number of Dreer’s Nursery garden implements and photos, plus original manuscripts, novels, and scrapbook by Riverton author Mary Biddle Fitler, and much more. Mrs. Biddle’s fictional book series for children began with the publication of Reddy in 1929 using Riverton as a backdrop. As publicized by the RFL Assn., tickets for the Candlelight House Tour are $15 Pre-Sale/ $20 Tour Night and are available at The Riverton Free Library, The New Leaf and The Guitar Guild. Ticket proceeds benefit Riverton Free Library. Admission to the Historical Society’s exhibition is free. This cherished Riverton holiday tradition returns after a cancellation in 2015. The weather forecast for this Saturday’s Candlelight House Tour in Riverton calls for 51 degrees and partly sunny skies. A tenth home has just been added to the tour. Extra tickets have just been printed and are still available at the Library, The New Leaf, Orange Blossom Cafe, and Fresh Produce of Palmyra for $15 in advance or $20 day of the tour. During your rounds of the decorated homes stop by The New Leaf for refreshment and entertainment. After a two-year absence, the Historical Society of Riverton’s Museum-for-a-Day returns, this time to the Library’s basement. Maybe we should call it Mini-Museum-for-a-Day since the space is small. Still, if you can venture downstairs, it’s worth the price of admission, which is free for this one day. Who knows when we can do it again? 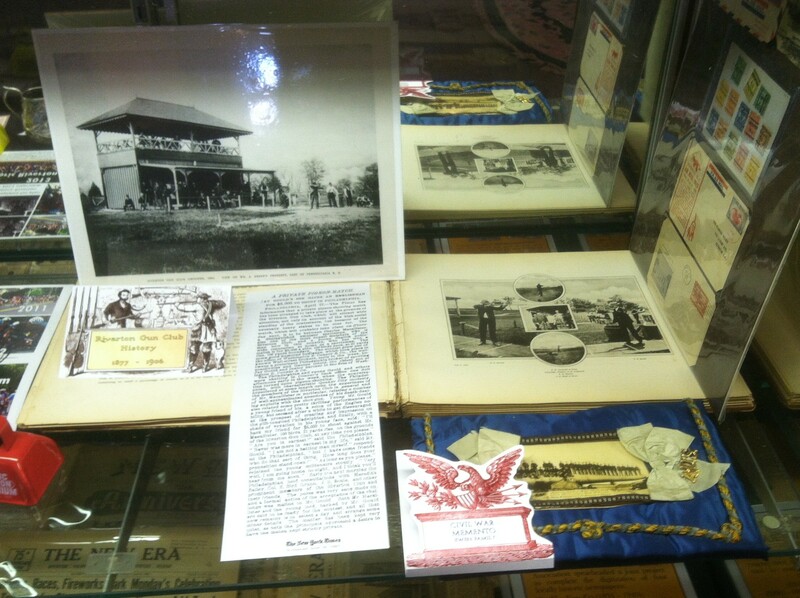 HSR Board members have prepared a number of exhibits of materials from our seldom seen archives. A remarkable highlight is Society member Dorothy Talavera’s own collection called A Family of Brides containing bridal gowns, photos, invitations, love letters, and mementos representing almost two centuries of brides in the same family. 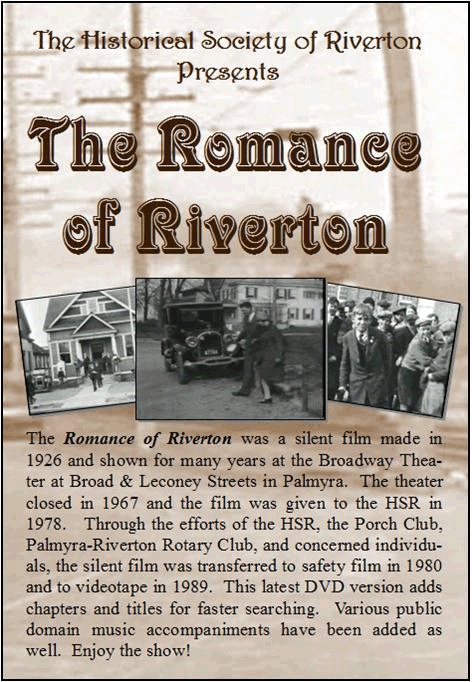 Upstairs, in the Library’s meeting room, we will screen the 43-minute DVD Romance of Riverton, filmed in 1926. It is available again for $20 after a sellout in 2015. Rev. 12/1/2016: This bulletin from Deb Lengyel – Here is a link to the 8-page tour booklet for a sneak preview of the homes this year. It includes a list of businesses and shops open for the event, a map, and provides descriptive information filled with architectural and local history details for the places on the tour. A history lesson in itself! Thanks to Deb and Idea Patio Creative Services for again generously donating her design expertise and a part of the printing costs to the project. Aggie Kennedy clothes a dressmaker’s form. Susan Dechnik took most of the photos here. 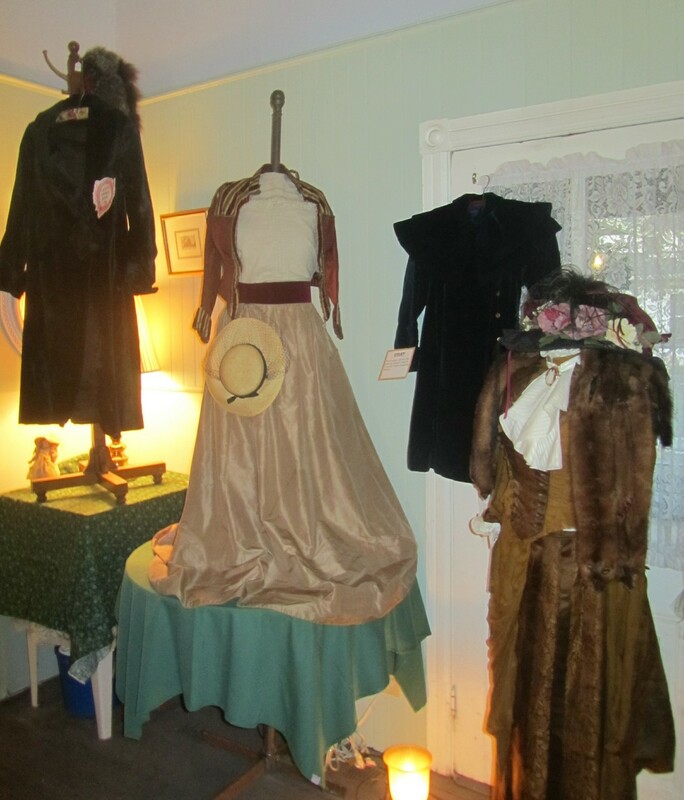 The reason for the recent inactivity here on the website is that we have prepared for our display of artifacts that we call our Museum for a Day at the New Leaf Tea Room in cooperation with the Riverton Free Library’s biennial Candlelight House Tour. The items come out to play for a day, then are packed away until we get another offer for some free exhibit space. Once every two years we get to break out of storage some choice HSR treasures to exhibit to the public. Afterwards, the items get packed away, and until the next time, this online virtual museum will have to do until we get a real permanent one. We brought out some familiar chestnuts such as some Dreer’s Nursery items, our vintage clothing, and the Riverton Gun Club history book. New additions to our exhibit repertoire include displays about Riverton’s War Memorial and Riverton’s military veterans, Riverton Yacht Club, and Anne Knight Ruff. I only just found a box postmarked 2011 in our storage space full of donated items relevant to the Yacht Club, particularly the Duster, that former resident Marty Carhart donated. More details of the remarkable contents will be forthcoming in a later post, but for now, blueprints for building a Duster and two reels of 16mm movie film taken of the 1949 Duster Championship race were just two of the more notable items. 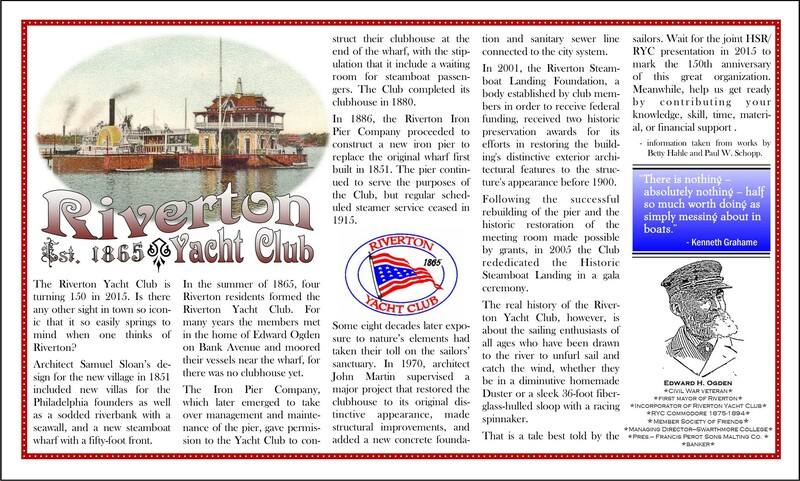 Also in that box, a 1965 book published for the 100th anniversary of the Riverton Yacht Club now serves as a startling reminder that 2015 will be their 150th anniversary. I made a poster outlining some of the milestones in the RYC’s history to go with the table display. “Tempus fugit,” as my Latin teacher used to say. Tempus fugit, indeed. I think time has even picked up more speed after I passed sixty. HSR Board Member Bill McDermott also pitched in as a Museum Guide. Turns out he had never heard the story about how Ed Merrill built the Duster in a workshop on the third floor of a house at 301 Main Street. There are probably many things we could all learn from each other if we could pool our resources. We have the bandwidth here if you have something to share. Readers, please search those boxes tucked away in attics and basements for anything you may have that would help to piece together a history of the RYC’s last half-century. Something spectacular is sure to be planned to commemorate that milestone, and with so many knowledgeable people now living far afield the internet is a great place to collaborate. 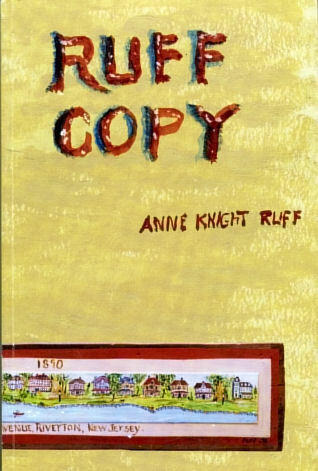 I made another poster that explained about Anne Knight Ruff’s book, hoping it would result in some sales, but no luck. This book is a treasury of Riverton history c.1890-late 1900s and should be required reading for anyone living in this zip code. 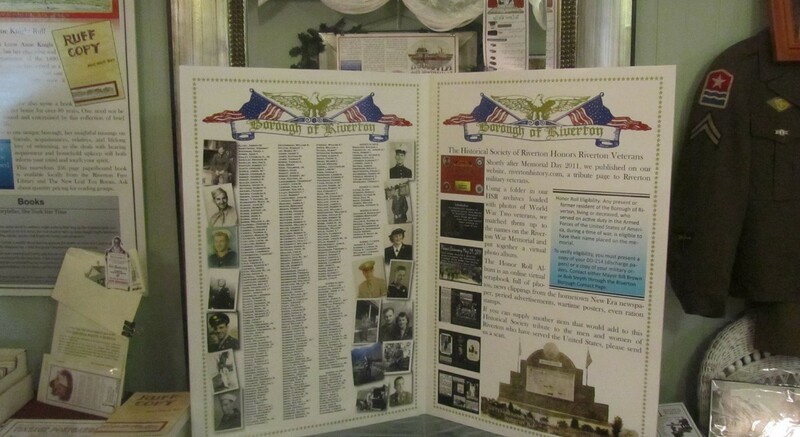 An exhibit about Riverton’s veterans included a poster with all the original names plus the names added since 2011. Longtime Riverton resident Daniel Goffredo lent us his World War II service uniform for the day. Earlier this year the HSR bought a presentation projector that we could use for just this type of situation, so we set it up with a screen to show the much expanded Riverton Veterans Album. Those old hometown newspapers that we got online in late 2012 have yielded a lot of anecdotal information about the people mentioned on the original War Memorial Honor Roll. Additionally, the newspaper files have been the source of many more news clippings about military personnel whom they described as being from Riverton. That might be the reason if you were to find a person mentioned in the pages of the Veterans Album, but their name is not on the War Memorial Honor Roll. 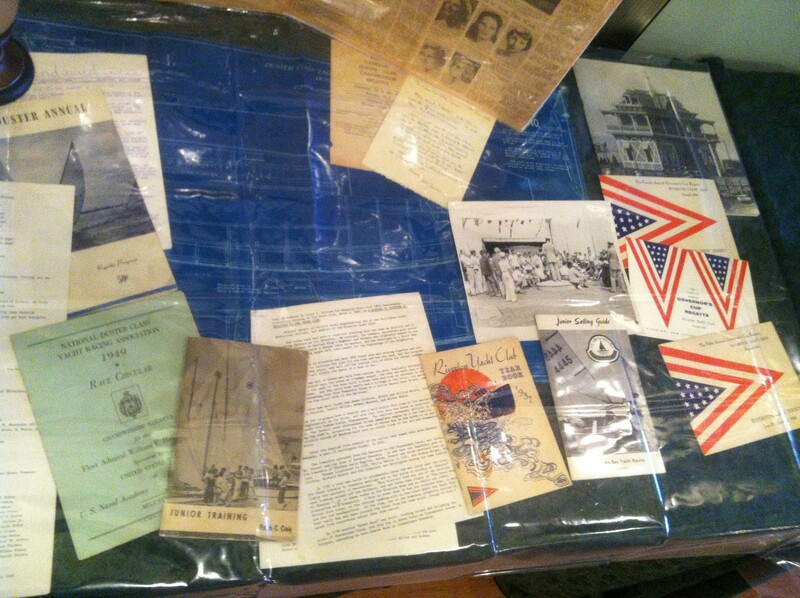 Carhart items – note newspaper from 90th RYC anniv. 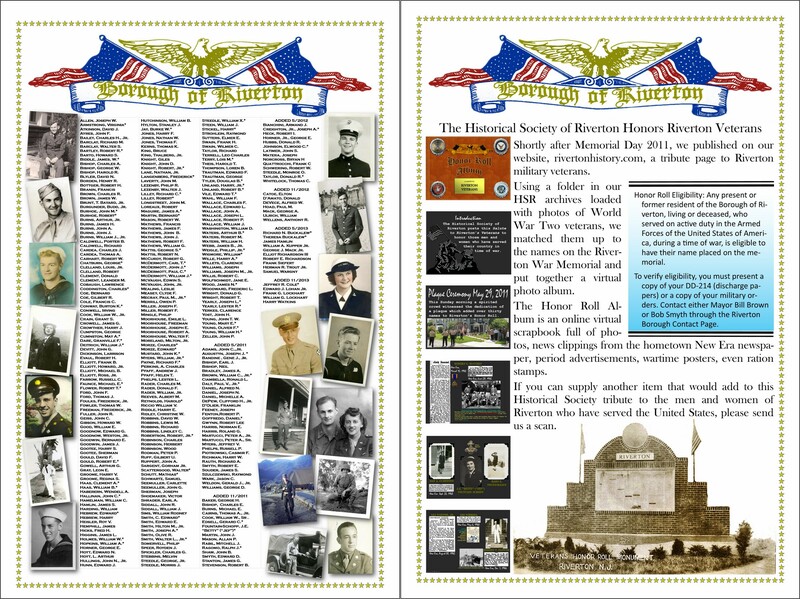 more HSR merch – flags, Romance of Riverton DVDs, notecards, RFCo. history book – sorry, no internet sales. One Society member commented that the homes on the December 3rd Candlelight House Tour December were “…historic and all quite beautiful.” This extraordinary biennial event invites the public inside some of the most distinctive homes and buildings in historic Riverton to raise funds for the Riverton Free Library. Hundreds of admirers of 19th century architecture came from throughout the greater Philadelphia and South Jersey area to view the historic buildings all beautifully decorated for the holidays which included five private homes plus the Porch Club, Christ Church, and The New Leaf Tea Room and Gift Shoppe. Click here for the PDF file of the Official 2011 Candlelight House Tour Brochure. Curator Mrs. Cheryl Smekal welcomed scores of visitors to our limited-engagement museum. 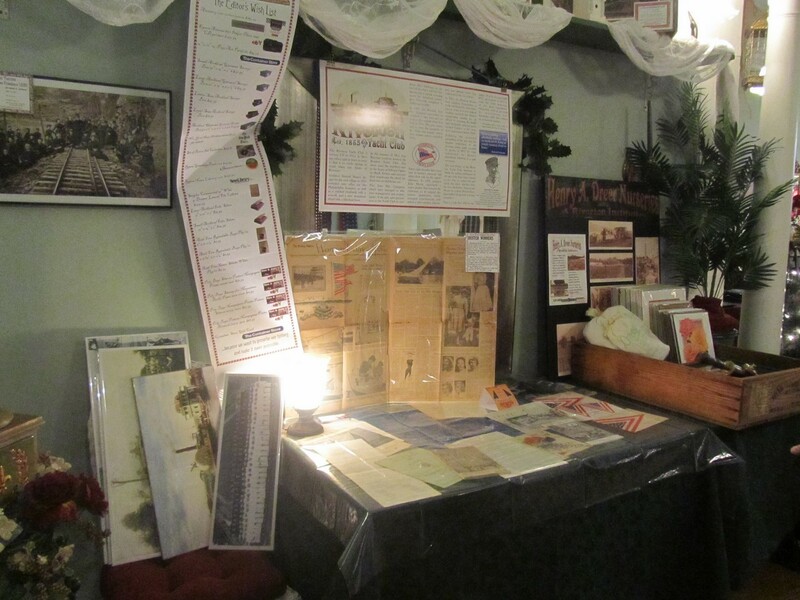 Mrs. Phyllis Rodgers, proprietor of The New Leaf, generously offered space to the Historical Society of Riverton (HSR) to host its popular Museum for a Day exhibition, a traveling display of local Riverton artifacts, photographs and ephemera from its archives. The showing offered a special opportunity for its exhibit curator, Mrs. Cheryl Smekal, to display women’s period clothing and furnishings as well as rare objects belonging to prominent Riverton families. Mrs. Smekal organized the event with assistance and guidance from Society Board members Mrs. Pat Brunker, Mrs. Nancy Hall, Mrs. Phyllis Rodgers and Mr. John McCormick. Can you guess the name or the use of these household items which might have been found in homes of the early 1900s? A table covered with 16 household objects common to the earlier 1900s which beckoned to onlookers, “Can You Guess…?” sometimes created traffic gridlock as museum visitors seriously debated the various uses to which some of the more puzzling objects might be put. John McCormick, Gaslight News editor, blogger, collector of Riverton objects and lore hopes to interest more people in contributing information and images to the Society. 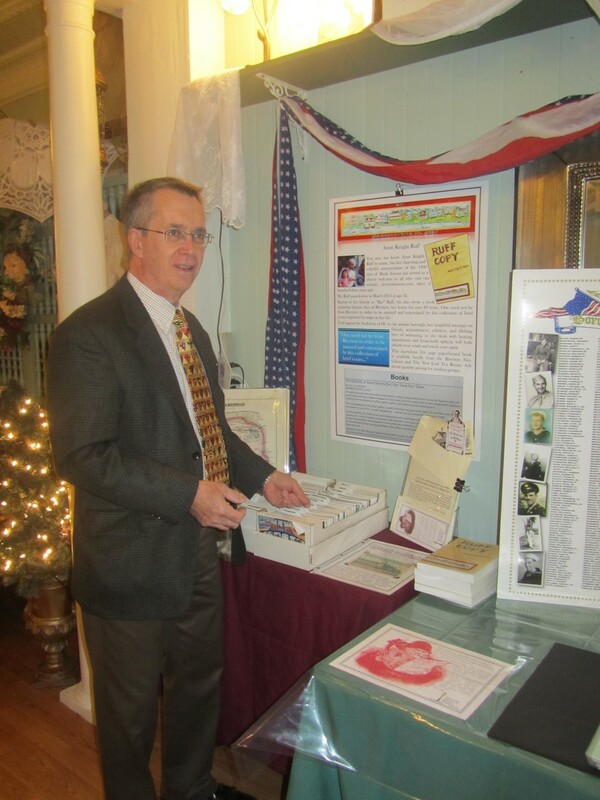 John McCormick was on hand to answer questions from collectors and the public about memorabilia and collectible ephemera. John, a retired educator and local historian, offered reproductions from his vast collection of local historic images with street views from local Burlington County towns. A display includes photos and artifacts from various business enterprises and a vertical wall banner which outlines the history of the New Leaf building. John devoted a section of the show of artifacts to The New Leaf at 606 Main Street since that address has played a number of roles in Riverton’s business section since it first was the location of Ezra Perkins’ butcher shop about 1900. You can view a PDF file of that banner that outlines the history of 606-608 Main Street here. Always of special interest to collectors are the vintage post card reproductions photo-restored by John McCormick featuring Dreer’s Nursery, New Jersey shore resort towns like Long Beach Island, Ocean City, Stone Harbor, and other locales like Burlington, Trenton, Moorestown, Mount Holly, Palmyra, and Riverside. One collector visiting the Society’s Museum for a Day was delighted to see that John had added considerably to what he had available at Victorian Day 2007, and he pulled up a chair and devoted over two hours to browsing the vintage postcard reproductions. Pat Lynch and Nancy Hall peruse the gifts available for the history enthusiast – Ruff Copy, Historic Riverton, History of Riverton Fire Co., Romance of Riverton, back issues of Gaslight News, History of Palmyra, repro maps and photos. The Society appreciates Mr. McCormick’s generosity in sharing his collection on the HSR web site and blog for people of all ages to enjoy. While an adult visitor may recall and perhaps even reminisce with the website’s content, a child seeing those same images and stories may see for the first time how life in his or her hometown was so different a hundred or more years ago. 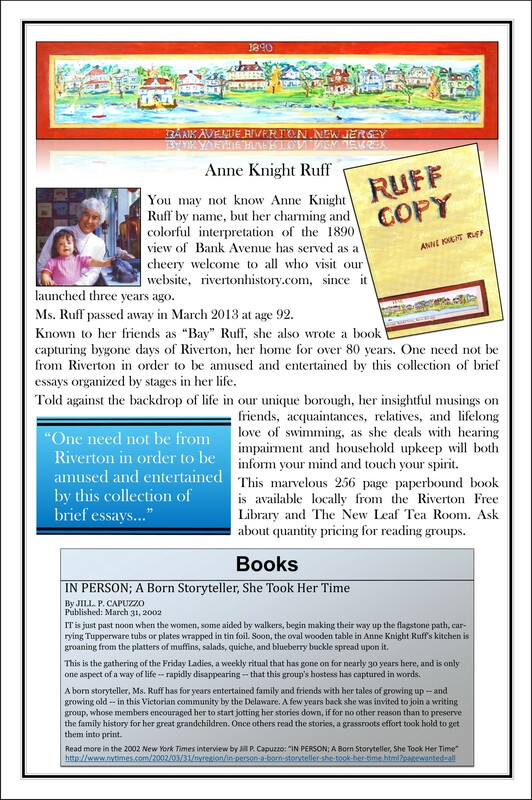 We commend The Friends of the Riverton Free Library for their successful house tour program which reminds us that our magnificent, historic homes in Riverton can be restored to their past splendor rather than sold as apartment conversions. The Candlelight House Tour significantly contributes to the rediscovery of Riverton by visitors and homeowners as a special place to live. The following photo gallery of our Road Show Museum will suffice until the HSR can secure a permanent solution to display the wonderful collection to which so many Rivertonians have contributed over the years. HSR President Gerald Weaber hopes that the One Day Museum results in more interest in local history.